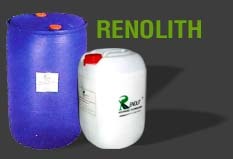 Renolith is a water-solvable, neutral and non-toxic polymer additive for road construction. It is easy to use in combination with soil and normal Portland Cement to create a solid and stable road base with in-situ material or sub base material. Therefore, the costs and time involved can be significant reduced.